Between Auxerre and Tonnerre, escape along La Route Touristique des Vignobles de l’Yonne... 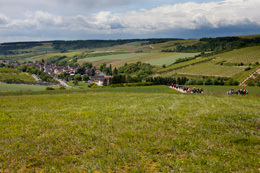 This enchanting itinerary will lead you to the very heart of the winegrowing regions of Chablis and Le Grand Auxerrois. On the way, call in at some wineries to taste their wines. You will also discover charming Medieval villages and landscapes that will leave you with some unforgettable memories. Just 1.5 hours by train from Paris, the Golden Gates to the Bourgogne winegrowing region will open up for you. Les Portes d’Or or golden gates is the nickname given to the Yonne department, reputed for its dazzling wines that are the pride of the locals. Set off to explore this charming region along La Route Touristique des Vignobles de l’Yonne. From Tonnerre to Coulanges-la-Vineuse, along the charming Serein Valley, you can discover 260km through the vineyards. Along the way, some 120 cellars are ready to welcome you for an indulgent pause. The winemakers will be delighted to share the flavors and secrets of their wines with you. Half of them have already signed up to the De Vignes en Caves charter, guaranteeing a warm and personal welcome. If you arrive from the north, you will start your tour in the Grand Auxerrois. With a dozen or so characterful villages, this region has four main winegrowing regions : the Auxerrois, of course, but also the Tonnerrois, the Jovinien and the Vézelien, scattered either side of the A6 freeway. Here, you will sample wines that have been crafted with passion. The white wines like those from Tonnerre, are sophisticated and aromatic. The reds, such as those from Coulanges-la-Vineuse, are ample and rounded. But there are plenty more appellations to delight your taste buds ! Between Chitry and Tonnerre, you are in the Chablis region. Its world renown is, in part, due to its limestone soil, rich in marine fossils. 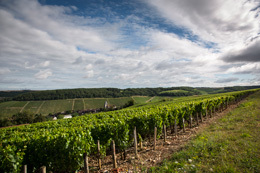 This unique land is the cradle of some prestigious white wines that are dry and sophisticated from the Chablis Grand Cru, Chablis Premier Cru, Chablis and Petit Chablis appellations. La Route Touristique des Vignobles de l’Yonne also gives you access to the Chablis region’s seven hiking trails, from 8-33km in length. They offer the perfect way to explore vines and forests, on foot or on mountain bike, and the trails are studded with beautiful views of the rolling landscape. If you’d rather wait for a more festive excuse to discover the region, then what better opportunity than the Rallye Découverte de la Route Touristique des Vignobles de l’Yonne ? Every year on the third weekend in May, this welcoming event celebrates the region’s heritage through games and visits. It is a great starting point for discovering Irancy when its cherry trees are in blossom, or the Medieval cellars of Saint-Bris-le-Vineux, with the family or among friends. To prepare your visit, you can find out more from the Association Route Touristique des Vignobles de l’Yonne. 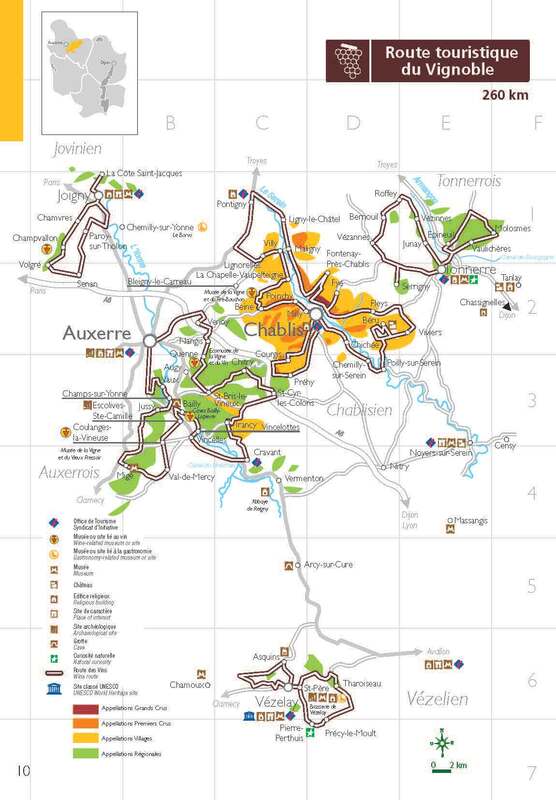 And you can obtain a detailed map of La Route Touristique des Vignobles from any tourist office in the Yonne department.